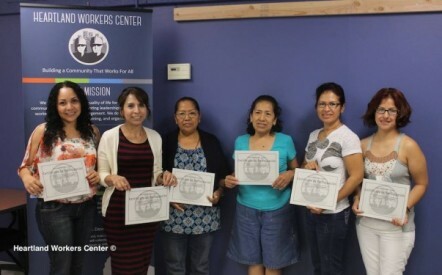 This summer the Heartland Workers Center began the annual Worker's Rights Series- partnered with the Safety Training Institute of Nebraska and OSHA. The first workshop was in June, where "Health and Safety at your Workplace" was fully covered because as an organization, we strongly believe that all workers have this right. Recently we partnered with OSHA and the first training was held at the Heartland Workers Center; targeting Health and Safety- for those that work within the cleaning industry. Our next Workers Rights Series will be Sunday July 26 from 3pm to 5pm. Every employer seeking guidance and assistance is welcomed to attend the Workers Rights Series! Please contact the Heartland Workers Center at 402-933-6095 and ask for Penelope Leon for more information.